If you’re traveling in Peru, you’ll likely end up visiting Cusco for some amount of time. Cusco is a beautiful, colonial town situated in the high altitudes of the Andes Mountains. 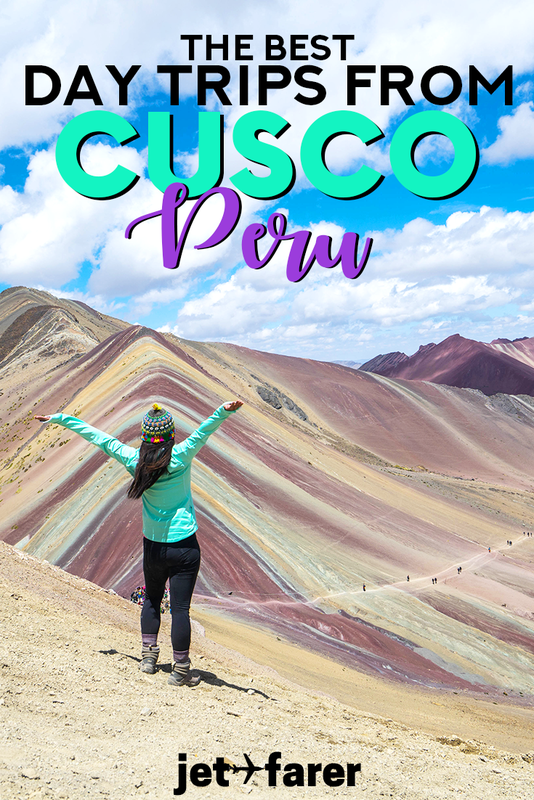 Although many people simply use Cusco as a jumping point for Machu Picchu and the Sacred Valley, it’s worth sticking around since there are many things to do around Cusco. After taking some time to acclimatize to the altitude, there are several day trips from Cusco to beautiful ruins, mountain areas, and natural wonders that you can discover. Read on for our top picks. One of the most obvious day trips from Cusco is to Machu Picchu — the famed Incan ruins situated high in the mountains. Designated a UNESCO world heritage site, it’s one of the most compelling reasons that people visit Peru. Their desire to visit isn’t unwarranted; with its stunning location and mystery-shrouded aura, Machu Picchu is truly a spectacle that belongs on everyone’s bucket list. While many people opt to trek to Machu Picchu, you can also visit it as a day trip from Cusco. In order to visit Machu Picchu, you’ll need to secure your ticket ($70 + any additional hikes) well in advance. These tickets are only good for one date and one time slot, morning or afternoon, so you’ll need to plan your timing accordingly. Either way, your day will begin REALLY early, by taking a taxi or collectivo to Ollantaytambo, where you’ll catch the train ($65-100+ USD round trip) to Aguas Calientes. From there, you can either hike (free) or take the bus ($12 USD each way) to the ruins. If you want to escape the crowds at Machu Picchu or do an extra hike during your visit, I suggest getting there at the earliest possible time during your time slot. A hidden gem located near Cusco, this is a challenging but rewarding long day hike for the adventurous souls out there. 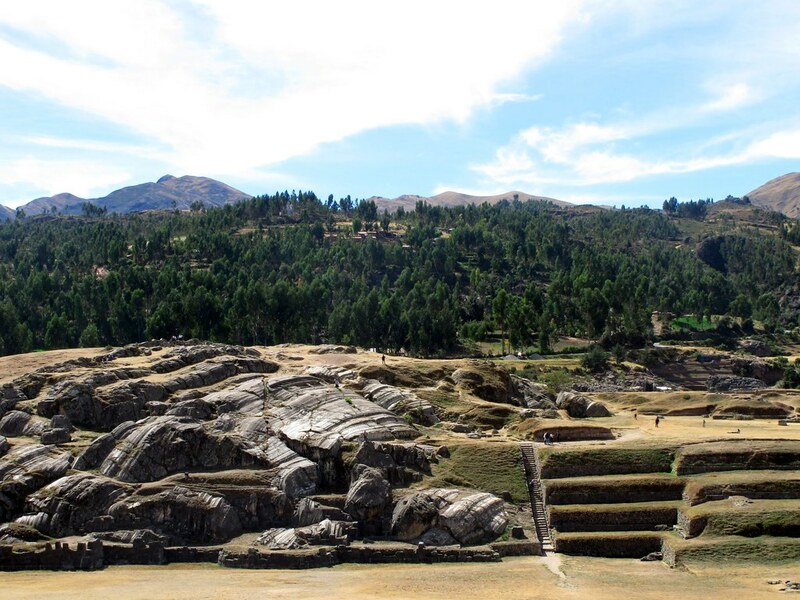 The 11-mile trail follows part of the famed Inca Trail and leads to some ruins of a once-magnificent Incan fortress. Perhaps an even more wonderful benefit of this hike is panoramic views of the surrounding landscapes, with mountains, valleys, and snow caps galore. While many tour operators in Cusco can organize a tour for this hike, you can also hire a private guide or do it on your own. If you’re hoping to try it yourself, you can follow the very detailed directions on this awesome post on hiking to Huchuy Qosqo by Di from Slight North. 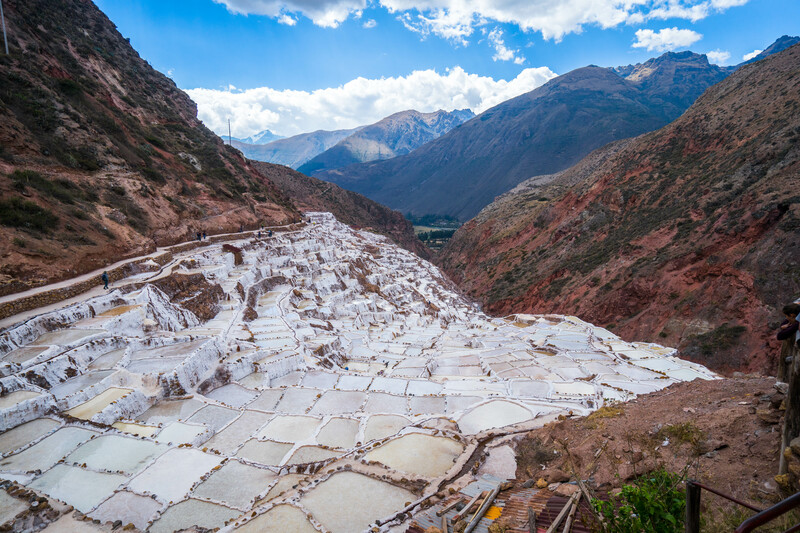 One of the most fascinating regions in Peru is the Sacred Valley, which is home to amazing Incan ruins, some strange salt flats, and a bunch of beautiful views and hiking trails to explore. This is an easy and popular day trip from Cusco, but to enter several sights in the Sacred Valley, you’ll need to purchase a boleto turistico (130 PEN or $45 for 10 days), which will grant you entry. We recommend getting an early start as there’s a lot to see in one day! There are two ways to get around the Sacred Valley: joining a tour group or hiring a taxi. If you are traveling solo, it’s more economical to join a tour group. However, if you have the budget, we highly recommend foregoing the tour and instead, renting a private taxi to take you around to the sights. The taxi should cost (with a bit of negotiation), ~$80-100 USD for up to four people for one full day in Sacred Valley. With its rapids and turns, the beautiful Urubamba River winds its way through the Sacred Valley. To enjoy the beauty and scenery of the river, one of the most thrilling and active day trips from Cusco is joining a white water rafting trip. You’ll join a small group, hop in an inflatable raft, and cruise down the river for 2-3 hours. To book a rafting tour, many companies recommend making a reservation well in advance, especially during the high season. However, you can also try to book a tour when you’re in Cusco with one of the local tour operators. Rafting tours are typically reasonably priced, with many of the online ones costing ~$50 per person. 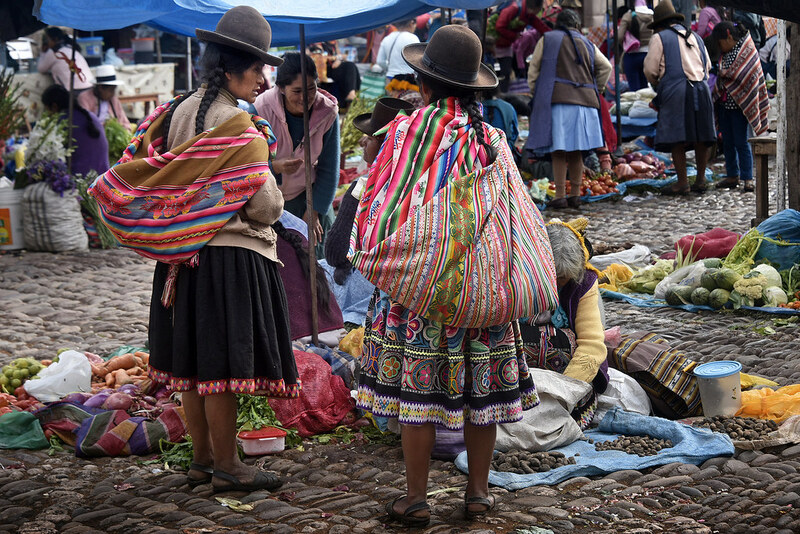 If you love people-watching and cultural experiences, you can’t miss Pisac, a small town in the Sacred Valley that’s home to one of the most spectacular markets in the region. Don’t leave this one out of your planned short trips from Cusco. A mix of produce and artisan (read: touristy) goods, it’s a feast for the senses (and the lenses, if you’re a photographer). On Sundays, the market is largest and attracts many locals who live in the higher altitude regions to sell their goods and pick up supplies for the week. However, if you visit on a weekday, the artisan shops will still be open for you to explore. Arriving at the market is fairly easy and straightforward. To get to Pisac, you can take a colectivo or a taxi from the Cusco bus station. It takes about 1 hour to arrive in Pisac from Cusco by car. If you’re fascinated by Incan culture but want to do more than simply hitting the main ruin areas, the Q’arañahui Caves and Qeswachaka Bridge is a short trip from Cusco that might be for you. These day trips are typically done with a tour group and leave from Cusco, first heading to the original Qeswachaka Incan bridge. Made of woven fibers, you can cross the Apurimac River via the bridge. Afterward, the tour takes you to the Q’arañahui Caves where you explore the impressive underground world there. You can book this as a tour online via a variety of operators or in-person in Cusco. We didn’t get to try this one ourselves, but have heard it’s really cool for those who enjoy caves and intrepid travel experiences. From what we saw online, prices tend to run pretty high, at over $100 USD per day. Typically, booking in person in Cusco is a bit cheaper. This isn’t quite a day trip from Cusco, but it’s far enough out of the city center that we think it counts. These Incan ruins, which overlook the city of Cusco, are located just outside the city up a very steep set of stairs. At the top, you can enjoy stunning views amidst the ruined Incan fortress structures (your boleto turistico from the Sacred Valley should let you in here as well). If you want to hike to some stellar views and amazing, off-the-beaten-path lakes, this is one of the most ideal day trips from Cusco. Accessible to all levels of hikers, it’s a great way to get outdoors and explore the countryside. Located just outside of Pisac, it’s an easy hour-long drive to arrive at the trails. The trip starts in Pisac, so much like the Pisac Market day trip, you’ll make your way to Pisac via taxi, bus, or colectivo. From there, hire another taxi for the day (be sure to negotiate beforehand), and head first to Kinsa Cocha Laguna, where you can hike to two interconnected lakes, and then head onward via taxi to the third lake. 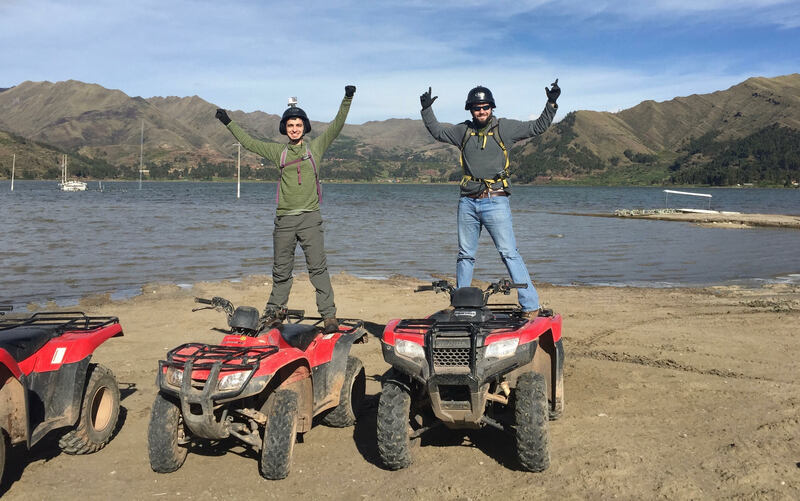 If you’re hoping to get some fresh air but also cover a lot of ground, one of the best and most fun ways to see the Sacred Valley is an ATV tour. Rafael (Jetfarer’s expert medical student and backend wizard) did this tour while in Peru and calls it one of the best day trips from Cusco. His favorite part about it? Traveling through remote villages, wildlife areas, and a gorgeous hidden lake high in the mountains. You can book this tour with many tour operators in Cusco. With the tour, you’ll drive out to the countryside and get briefed on how to drive the ATV. Then, you’ll spend approximately 4 hours touring around in your group (with a guide of course!). Want to learn more about traveling in Peru? Don’t miss our Peru destination page! I am planning Peru for maybe the end of this year! Macchu Picchu has been one of my goals for since forever! These other day trips from Peru looks beautiful too! Another great post Kay! When I think about Peru the first thing comes to my mind is Machu Picchu. It’s very fascinating place without any doubt, but I’m happy to see/find other places to visit in Peru as well. Thanks!! These all look so amazing! I will get myself down to Peru eventually! I didn’t realize there are so many things to do in the area. We had to be in Cusco 3 days before we started our Inca trail hike, would have been great to know about some of these things before!